JND was a prodigious writer who had a major influence on evangelical thinking in the 19th Century. Here are just a few of his articles. “Satan is active, and his power consists in producing distrust, and this where there is happiness and intimate relation with God - to darken, and, if possible, destroy all in the heart. “Would not such a thought as being in God's court, as men dwelling in God's own house, greatly delight and surprise us, if heard for the first time and its meaning understood? The motive to, yea ground of, a Christian life is that we died with Christ; and we have life through a dead Christ, with whom we died. 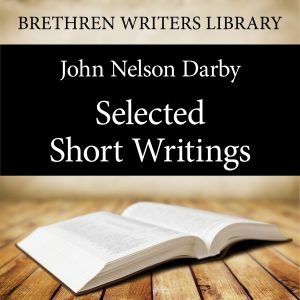 A word about the author: John Nelson DARBY (1800 -1882) came from an Anglo-Irish landowning family seated at Leap Castle, King's County, Ireland. His middle name was given in recognition of his godfather and family friend, Lord Nelson. Born at Westminster, he was educated at Westminster School, then at Trinity College, Dublin. He was studying for Law when he was gloriously saved and felt that being a lawyer was inconsistent with his religious belief, so he studied divinity instead. Around 1830 he joined an interdenominational meeting of believers (including Anthony Norris Groves, Edward Cronin, J. G. Bellett) who met to "break bread" together in Dublin as a symbol of their unity in Christ. By 1832, this group had grown and began to identify themselves as a distinct Christian assembly. As they travelled and began new assemblies in Ireland and England, they formed the movement now commonly called ‘Brethren’. He used his classical skills to translate the Bible from Hebrew and Greek texts into several languages. In English he wrote a Synopsis of the Bible and many other scholarly religious articles. He wrote hymns and poems, the most famous being, "Man of Sorrows”.